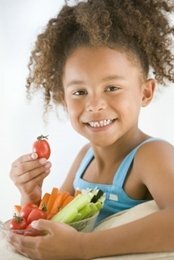 Here are some healthy snacks for kids to make finding and eating something healthy a snap, even when you are on the run. You likely have plenty of healthy snacks for toddlers at your fingertips already! 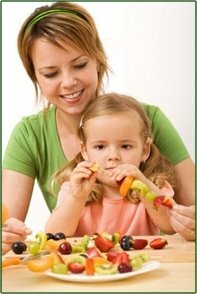 Healthy snack ideas are hard to come by when you are stressed, but the fact is, if you stock your house with healthy foods as described in our Importance of a Healthy Diet and Healthy Eating Guidelines, you likely have plenty of healthy snacks for children in your kitchen, you just don't know it. The same celery and carrots you should have on hand for making broth and stew are healthy snacks for kids with only a little preparation. Rinse and slice and you are ready to go! We like to cut them in julienne strips for young ones that are just starting out on solids. Slather some peanut or almond butter in the crevice of celery and you add a little protein as well as a much healthier alternative to a peanut butter and jelly sandwich! Dehydrated organic fruit "chips" or "leather" are wonderfully healthy snacks for kids in addition to being a great way to enjoy some of the vitamins and fiber in fruit. We often add raisins, apple chips and dried apricots to our "trail mix". One of our favorite healthy snacks for kids, that also doubles as a "dessert", is "Swirlys". Easy to make, you scoop plain, whole milk organic yogurt into a bowl and add a big spoonful of Annie May's Unsweetened Organic Blackberry Applesauce. Then either an adult (at the start) or the kids run their spoon thru the purple applesauce to make designs in their white yogurt. Swirls are often a result, thus the name.